For other things the name Splatoon is used for, see Splatoon (disambiguation). Splatoon (スプラトゥーン Supuratūn) is a third-person shooter developed and published by Nintendo. The game features battles between Inklings, using weaponized ink to cover territory and "splat" opponents. The game was first revealed at the Nintendo E3 2014 Digital Event and was released for the Wii U on 29 May 2015. Splatoon's successor, named Splatoon 2, was released for the Nintendo Switch on 21 July 2017. 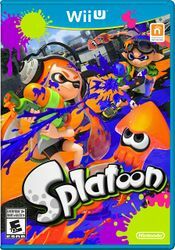 It includes brand-new weapons, gear, stages, modes, and also a new story, set two years after the original Splatoon. An early design of Splatoon featuring blocks of tofu. Splatoon was first created by Nintendo Entertainment Analysis & Development in late 2013, directed by Yusuke Amano and Tsubasa Sakaguchi, and produced by Hisashi Nogami, longtime director for the Animal Crossing series. The team had thought of over seventy game ideas, but decided to focus on a game involving inking turf. At first, this concept featured black and white blocks of tofu with noses that sprayed ink. The game featured a top-down view, allowing the tofu blocks to blend in with their splattered turf. However, these characters presented a variety of problems, so development began on a different character that was vaguely humanoid in shape. A rabbit was chosen as the design, because its floppy ears would indicate what direction it was traveling when viewed from above. Many EAD developers criticized this idea, so ideas such as Mario, robots and macho men were considered. The rabbits were later scrapped in favor of a squid, because the team wanted a character that made sense in regards to the environment and gameplay mechanics. The squids at this stage appeared to be squid-human hybrids, but it was decided that instead of this design, the game would feature humanoid Inklings with the ability to transform into squids. A few weeks before release, the Splatoon Global Testfire application, a limited Splatoon demo, was released for the Wii U. Players could download it and play on the 8th and 9th of May, 2015, at 3:00, 11:00 and 19:00 UTC, for one hour at a time. A second Testfire event happened on the 23rd of May, 2015, at 22:00 UTC. Due to complications, the event was extended to run for two hours instead of one. The single player Octo Valley mode tells the main story of the game. Many years after the great Turf War, with the hope of invading the Inklings' world, the Octarians built an underground facility known as Octo Valley. After the disappearance of the Zapfish from the Inklings' world, the protagonist, wearing the Hero Suit, must infiltrate the base and rescue all the Zapfish. Splatoon is a third-person shooter game focused on online multiplayer battles, in which eight players are divided into two teams of four. In the game mode Turf War, teams fight to cover the arena in as much ink of their team's color as possible. In Splat Zones, they try to control certain zones for a set amount of time by covering the Splat Zone(s) in ink. Players have two main forms and may switch between the two at will: their humanoid form, in which they can use weapons to spread ink and splatter opponents, and their squid form, which they can use to swim through ink at great speed and up walls, recharge the player's ink tank faster (while in their own ink), and hide in their team's ink. 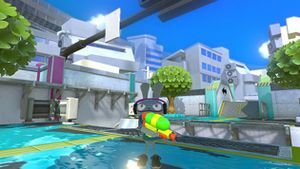 Players can also utilize Sub Weapons, such as Splat Bombs, and Special Weapons, such as Inkzookas. In the primary game mode, Turf War, players are awarded points based on the amount of land they cover in their team's ink—the team that covers the most territory within three minutes wins the match. Splatoon also features a single player Octo Valley mode, which sees the player travel to Octo Valley and traverse levels based on 3D-platforming and puzzle solving. Since its initial launch, Splatoon has received many DLC updates to introduce new stages, weapons, and wholly new gameplay modes to the game's multiplayer mode. In addition, Nintendo also announces and hosts semi-regular community events called Splatfests where players pick a team to side with and play turf wars against each other for prizes and glory. Both upcoming DLC as well as upcoming Splatfest information can be read about on Splatoon's official Tumblr page, named Live from Squid Research Lab. In June 2015, a Splatoon manga was released by Sankichi called Splatoon (Splatoonスプラトゥーン Splatoon Supuratūn, translating to Splatoon Splatoon) to celebrate its release in Japan. 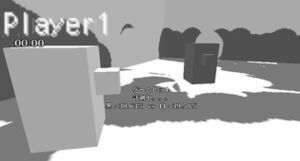 However, this was a fan-made one-shot, and the offical version was released in December 2015 as a one-shot type until April 2016. Splatoon shown as the most requested game on Nintendo eShop. Splatoon is a portmanteau of "splat" and "platoon." The Inklings' squid form shares strong similarities with Bloopers from the Super Mario series. In the single-player trailer from the November 2014 Nintendo Direct, a frame of artwork consists of Bloopers from the Super Mario series and Octoroks from The Legend of Zelda series. 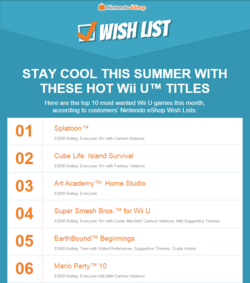 According to an email sent by Nintendo, Splatoon was listed as the the top wish-listed game in Nintendo's eShop over the summer it was released. This page was last edited on 18 August 2018, at 21:48. This page has been accessed 172,190 times.